I’m with loribird, wear the glasses, there are too many cool things to see on Halloween. Have fun! That mask is spooky as heck. The kids will be too afraid to try to take advantage! And yeah, sometimes I hate wearing glasses. Eeek! That is definitely a spooky piece of knitwear! This is so cool! I have been meaning to knit this, so thanks for sharing your thoughts and tips for the eyeholes. Happy Halloween! 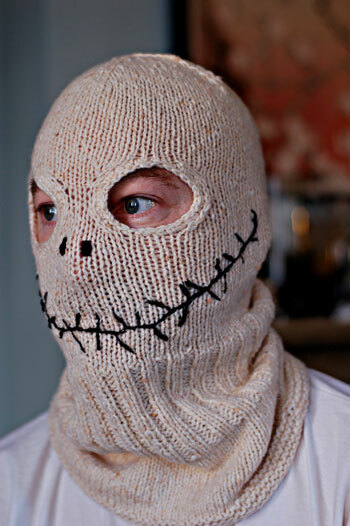 spooky — it’s really awesome and wish i had time to knit this. but i won’t even be home for trick or treating this year. i’ll be in class until 10. Yeep! I will not be coming to your house for candy. velly skelly! look out Edvard MÃ¼nch. My little Maggie says of your mask: “pookie” which I think means “spooky.” She also said owl, so maybe it looks like a spooky owl? I dunno, but it’s fantastic. Freaky! That is great. I know a few people here who might force me to knit it, if they saw it! Very, very creepy–in a good way. Next time you could make some ear holes for your eyeglass side pieces and wear some ghastly looking sunglasses over it. That would really freak out the little goblins. So so awesome! I totally love this! This scares me every time I see it, but it’s still sooo awesome! Thanks for the mods. I’ll definitely incorporate in ours. Liking that tidiness. Fantastic! Make sure to take some pics of you in it too! Happy Halloween! Oh – I wish I had made one of those for tonight! Very scary – I esp. love the cross eyed picture! I was so happy to see this on your blog. I just made one (in black, by request) but I haven’t sewn on the white nose and mouth yet. It’s for a friend who looks quite mild-mannered on the outside, but has a wild side not many people see. Perfect.